On a Wednesday afternoon in early May, after a full day of studying the Byzantine Empire and sitting through lessons on annotation and critical reading, the sixth-graders in Zsazita Walker’s social studies and language arts class were, expectedly, acting like sixth-graders. School was almost over and the classroom, scattered with posters, worksheets and lesson plans, was buzzing with chatty, curious 10-, 11- and 12-year-olds who knew they'd soon be free from class. But before dismissal, one exercise remained. The kids shuffled from grouped tables to neat, forward-facing rows of desks. Walker counted down from five, telling her students to make sure the table tops were cleared. A boy walked to the front of the classroom, sat in a chair to face his classmates, and rang a bell. Nearly in unison, the 25 students in class 601 at New York City's Brooklyn Urban Garden School closed their eyes. Some put their hands over their faces, creating little bubbles of darkness. Others put their heads down, as if to fall asleep. It was Quiet Time, which is exactly what it sounds like. In a city where silence is elusive, these students begin and end the day with it. If they choose to, they can meditate. The students sat for 15 minutes without making a sound. From the outside, it looked like nothing was happening. But nearly three-quarters of the students later said they spent the time meditating, reaching the inner depths of their consciousness in deep relaxation. After Quiet Time that day, a handful of students opened up about it. “I get into a lot more arguments with people when I do not meditate. I think it makes you feel less stressed,” one boy said. “Your mind goes to rest, and we need that,” a girl added. BUGS, as the charter school is called, adopted Quiet Time when it opened in 2013. The school focuses on sustainability and holistic education and has three full-time staffers who teach kids about the practice of and science behind meditation. Located in Brooklyn’s Windsor Terrace neighborhood, BUGS serves New York City’s District 15, which includes some of the richest and poorest neighborhoods in the city. The school has about 200 students, nearly half of whom qualify for free or reduced lunch, and nearly one-quarter of whom have disabilities. 15 minutes in the morning and 15 minutes in the afternoon. Quiet Time was developed in the 1990s by a Washington, D.C., school principal. It was initially intended to be a one-off effort, but it took off: In the last seven years especially, it has expanded, and now appears in 18 schools across the country. It's one of a handful of meditation programs funded by the New York-based David Lynch Foundation; others target veterans, survivors of sexual assault and domestic abuse, prisoners and people who are HIV-positive. The organization focuses on Transcendental Meditation, a method made famous by the late Maharishi Mahesh Yogi. The technique’s best-known American practitioner may be the foundation’s namesake, director and TV producer David Lynch. Lynch, a longtime TM proponent who studied under Maharishi, established the foundation in 2005 to fund meditation instruction in schools in the U.S. and abroad. In the last decade, it's garnered $30 million to spread meditation across the world, and boasts of having taught 500,000 students in more than a dozen countries, including Peru, South Africa and Israel. Ultimately, the organization's goal is to raise enough money to allow any school system in the world interested in Quiet Time to institute the program, said Bob Roth, the foundation's executive director. "Long term," Roth said, "we think meditation should be offered just like P.E." TM consists of repeating a personalized mantra -- it can’t be a word or a sound that has actual meaning, as those are deemed distracting -- silently for 20 minutes. Kids, like those at BUGS, do it for shorter periods. Compared to other methods of meditation, TM requires “no concentration, no control of the mind, no contemplation, no monitoring of thoughts,” according to official TM materials. Meditation teachers often use an analogy of the sea to describe the process. “You’re in a small boat in the middle of the ocean and all of a sudden, you get these huge swells. You think the whole ocean is in upheaval. Well, if you take a cross-section of the ocean, you’ll see the surface is active but the depth is naturally silent,” said Roth, who has meditated for more than 40 years. Through twice-a-day meditation, practitioners believe everyone can access an intensely deep rest that allows the body to repair itself and “release deeply rooted stress and tension that sleep never gets rid of,” Roth said. And that kind of deep rest, he and others believe, can be incredibly beneficial. Among adults, scientific studies have shown that people who meditate have lower stress levels and a decreased risk of high blood pressure. They also report greater levels of happiness and confidence. students who want to learn more about meditation. Because the Quiet Time program is relatively new, data on its impact on kids is limited, but early studies point to better grades, fewer suspensions and reports of better mental health among student meditators. “When you meditate, you produce alpha waves, your body calms down, your pulse drops, you go out of the fight-or-flight mode. Your cortisol levels drop. Your body gets a break. It feels pleasant,” said Joshua Aronson, an associate professor of applied psychology at New York University who has studied the impact of Quiet Time on students. The David Lynch Foundation focuses its efforts on middle schools and high schools with higher-than-average rates of absenteeism, teacher turnover, and gaps in grades and graduation rates. In a survey released last month, the Council of Chief State School Officers and Scholastic Inc. found that the nation's highest-ranked teachers named family stress, poverty, and learning and psychological problems as the top barriers to academic success. Meditation is one tool that can help students clear that bar, he said. Quiet Time is part of a broader movement among education districts and individual schools experimenting with programs that include mandatory yoga and optional lessons in mindfulness. In the first semester of Quiet Time at Visitacion Valley Middle School in San Francisco, which introduced the program in 2007 and is in a district that has become the one of its strongest supporters, administrators reported that suspensions dropped by 45 percent among students who participated in Quiet Time compared to those who didn’t. Over three years, Visitacion Valley, which is located in one of the most violent neighborhoods in the city, saw a 75 percent overall drop in suspensions. About 20 percent of students now are accepted to Lowell High School, the top public high school in the city. Before the launch of Quiet Time, only a few made the cut each year. A directive to improve test scores forced administrators to get creative. The school pushed counseling services and peer mediation, after-school tutoring, sports and music lessons and better ties to community groups. Then, it introduced kids to Quiet Time. Although it took several years, Dierke says meditation did the most to turn the school around. “I look at meditation as being an umbrella that we were able to put over the top of the school and keep the rain off,” he said. Many of his fellow educators agree. Currently, five schools in San Francisco have Quiet Time, and Superintendent Richard Carranza has said that he wants to see it expand. 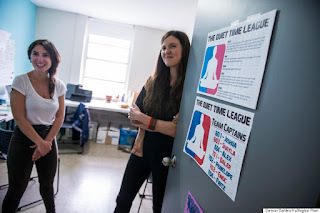 With Quiet Time schools in New York, San Francisco, Los Angeles, Detroit, New Haven, Connecticut, and Washington, D.C., Roth and his David Lynch Foundation colleagues are currently looking to bring Quiet Time into Chicago schools. the classes with the highest-scoring Quiet Time performances. Walker, the BUGS teacher in Brooklyn, occasionally joins her students in meditation or does it on her own before the school day begins. “For myself, when I don’t meditate, I am a little more of a scatterbrain,” she said. “I’ve noticed in my students that if they miss the morning Quiet Time if they are late to class, they are the same way.” She said one of her students who has “issues with anger” occasionally leaves the classroom to meditate to avoid an outburst. Quiet Time isn’t without its detractors. When it was first launched in California, some parents, as well as a nonprofit called Americans United for the Separation of Church and State, protested, saying the practice was rooted in Hinduism and violated the First Amendment. Meanwhile, the Hindu American Foundation ran a campaign about the importance of honoring the Hindu roots of yoga and meditation, and called out TM for its secular approach. But Roth and others who promote TM say the practice doesn't require any specific beliefs. These days, the complaints are less frequent. However, kids do need parental permission to participate in meditation. The ritual, like nearly everything else in school, is also graded. At BUGS, each student is scored by the teacher on a zero-to-two scale every time he or she meditates. 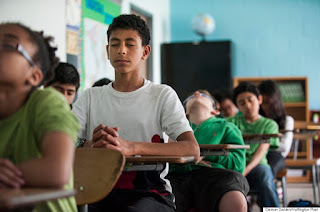 A two means a student sits up with his or her eyes closed for most of Quiet Time. A one means a student’s eyes are open or his or her head is down for most of the session. Students who cause a disturbance get a zero. Each trimester, students’ average scores are converted to grades that go on their report cards. 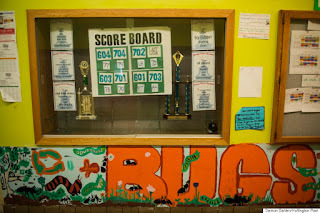 In the hallway, a scoreboard keeps track of the classes with the highest weekly Quiet Time scores, while a display case has two trophies from the past year’s winning sixth- and seventh-grade classes.